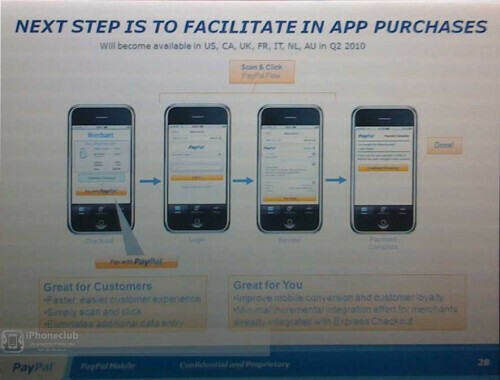 PayPal has announced that it will facilitate payments for apps purchased in the Android Market and in Apple's App Store. This will allow you to purchase apps without having to use your credit card. Currently, paying for an app in the Android Market requires Google Checkout which itself uses a credit, debit or gift card to fund the payment. But in some countries, credit cards are not as common as in the U.S. which is where PayPal comes into play. The service will start sometime this quarter for the iPhone and Android devices in the U.S., Canada, U.K., France, Italy, Netherlands and Australia. PayPal has an app for the iPhone called "iPhone Library" that will accept PayPal payments directly from users and has already been submitted to Apple for approval.